This week’s pick is one of those picks that feels like a big one for me. It’s one of my favorites and has been for quite some time. I’ve been excited to show this to Aaron, but for some reason or another, I kept pushing it back. But here we are! We got to it! Yay! Last week Aaron chose American Graffiti. This week Michael takes Aaron out from under the proverbial rock to show him Léon: The Professional. Michael Ornelas: I wanted Aaron to see this film because I adore the Léon character. His complexity fascinates me as he has a very clear moral compass, but it’s definitely off a bit given his line of work. Despite all that, he proves to be a good man, and more importantly, a mature adult who’s able keep an infatuated child’s advances at bay while still communicating is almost-paternal love for her. Aaron Hubbard: This one is tough for me to review. I can definitely see why people like it, it’s well made and well acted. But it feels exploitative in a way that really made it hard for me to enjoy the movie beyond a superficial appreciation of the craft. Michael: The external plot of this movie lies in the craft of contracted killing (or “cleaning”, as Léon calls it). At face value, this movie dives into the process of being a hitman (which is more or less what the theatrical cut of the film is about — we watched the extended cut, however). And it’s really unique. The film’s most light-hearted moments ironically come while a man is teaching a child how to effectively kill people. The scene where Léon busts into the drug dealer’s apartment and has Mathilda simulate the kill with a paintball gun before he does it is borderline adorable, which is funny to me given that this movie is very heavy at times. Aaron: This aspect of the film was the highlight for me. 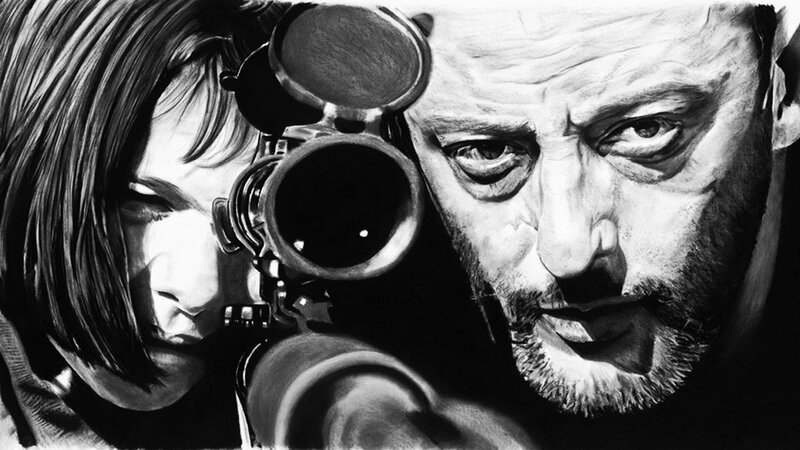 I enjoy Léon doing his work and teaching Mathilda how to do it as well. I actually wonder if I might have enjoyed the film more if I watched the other cut, since my research shows that most of the skeevy scenes were removed. But I can’t say. Michael: The theatrical cut is about 40 minutes shorter if I remember correctly. That’s a LOT of the movie to chop out. And I disagree that it’s skeevy. Definitely uncomfortable, but given how one-sided the sexuality is, and how clear Léon is with his “no”, I have a hard time calling it skeevy. That said, I’m sure we’re about to dive into that a little bit more. 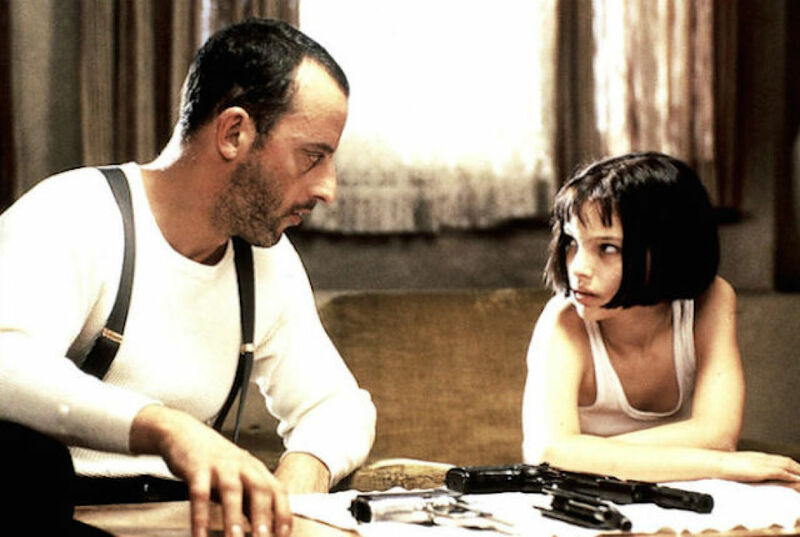 Aaron: I don’t want to rail against anyone if they love this movie, but Mathilda is a character that just doesn’t work for me on film, especially the way she’s done here. Is it impressive that Natalie Portman gave such a great performance at her age? Yeah. Does it change the fact that she spends the entire movie in clothes that are inappropriate, that she acts overtly sexual or that the film never has Léon take a firm moral stance on her advances? Not for me. As the film went along it started to overwhelm my opinion of the film; I was hoping Léon might be a positive influence on her, but ultimately he isn’t really. It’s uncomfortable for me and I can only imagine what it would be like for women who have more in common with Mathilda than anyone should. Michael: I feel the need to clarify that I don’t enjoy this aspect of the film, but I respect the way Léon handles it. I feel that his constant denials of her advances are his moral stance as actions speak louder than words. But words can cut deep and to a girl who has shown to be insecure due to an abusive past, and even bluffed a suicide attempt in front of the guy, it’s hard to blame him for not shutting her down in a harsher, more serious way. It’s obviously a line that if he crossed it, I wouldn’t like the film or recommend it to anyone, but the complexity and the way it’s explored is something I guess I disagree about. The only thing I’m really uncomfortable with is the wardrobe decisions for Mathilda’s character, and the way some of the frame compositions exploit her to the viewing audience. It’s not often, but when it does, it’s noticeable. Aaron: For me, it’s just a little too real. Léon is somebody who clearly has his own issues and needs to “grow up”; he lacks the ability to step up and be parental towards her. The fact that it’s vague is what bothers me; I think the film could have benefitted from making the relationship a little more clear and less muddy. Something that I feel is an oddly appropriate comparison is American Beauty, which deals with similar issues but takes a clear stance at the right time. Sometimes moral ambiguity just doesn’t apply to a situation. In my opinion anyway. To me, it detracts from the film and keeps it from being great. Michael: This isn’t anything new to the action genre which, if anything, almost always excels at creating high stakes for the characters. But this film takes it to another level. Everything is coming at you guns blazing, and then we find out the main baddie is a cop who has a solid chunk of the force behind him. This all leads up to one of the more epic action climaxes I’ve ever seen as the SWAT team is infiltrating the build to try and take Léon out. It’s his training and discipline vs. theirs and this man of very simple principles proves to be superior in this end. Kind of. It’s full of excitement which, at the end of the day, is what I want to see in films of this genre. Aaron: The last twenty minutes of this are incredible, and despite my reservations I definitely recommend this movie just for the finale. It’s creative, hard-hitting, packs an emotional punch, and just delivers everything you could want from a film like this. I don’t really consider this an action movie per se, but it definitely delivers when it wants to. Aaron: This one is a tough one to rate; the letter grade is in recognition of the acting, filmmaking and the strength of the story and its major beats. But it’s also a film that’s too problematic to become a favorite for me. I don’t hold it against anyone, but for me, this will probably be a one watch film. Michael: While that same discomfort is there for me as well, it didn’t overwhelm me or detract from the film because Aaron and I simply disagree on whether or not it was well-handled. It’s undeniable that the story is unique, interesting, and well-executed, and the movie is exciting, well-shot, and has fascinating characters. Aaron: And as always, life experience tends to color certain things. I do recommend the movie, I just have issues and I think other people may also find it upsetting. Is this film too uncomfortable for you? Aaron: You know what I don’t do very often? Pick bad movies on purpose. Let’s buck that trend with a movie that could have only happened in the mid-1990s. Michael: I know nothing. When did it happen? I’m guessing the mid-1990s? 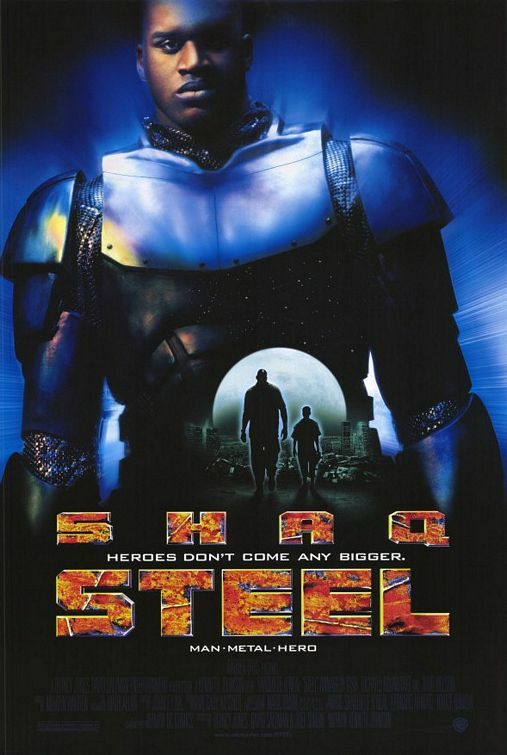 Aaron: Shaquille O’Neil plays a C-List DC superhero who was created when Superman died. It’s like the perfect storm of 90s cheese. What’s the worst superhero movie you can still enjoy watching? Hey? You wanna read about Godzilla? Because I wrote about the 1954 original and you should check it out. 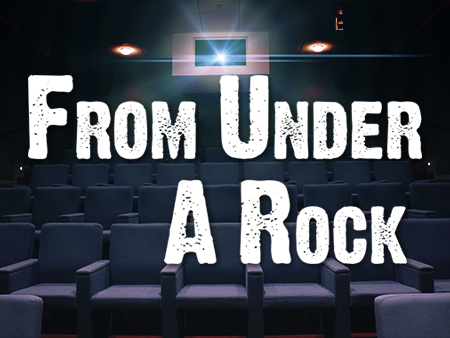 Check me out here to see my star ratings for over 850 films. Recent reviews include The Big Sick, one of the best films of the year, and M, one of the best movies ever made. Léon: The Professional gets a solid recommendation from us, though with some reservations. It's got a solid plot, two fantastic lead performances, and finishes strong with an emotional and thrilling action climax. Some may find the character of Mathilda exploitative in an uncomfortable way, but if you can look past that, it's definitely worth seeing.